Here are a few of the books I read this summer. Mountains Beyond Mountains: The Quest of Dr. Paul Farmer, A Man Who Would Cure the World by Tracy Kidder - I strongly recommend this book about Dr. Paul Farmer and his work with infectious diseases in Haiti and other countries. While I'll never be a Paul Farmer, he encouraged me to not give up even if the situation seems insurmountable. Stones from the River by Ursula Hegi - This novel is over ten years old so you may have read it already. I almost set it down because I didn't want to read about a zwerg (dwarf) in Hitler's Germany, but I'm glad I kept reading as it taught me that everyone needs to figure out how to handle whatever it is that makes us different. The Pilots Wife by Anita Shreve - Not in the same class as the other two books, but a good page-turner. I enjoy detective novels. My all time favorite is Nero Wolfe and Archie Goodwin. I've discovered that I like an impertinent but intelligent, wise guy character (Archie). That's part of the reason I also enjoy Nelson DeMille's character John Corey in Plum Island and The Lion's Game. I was looking forward to reading James Patterson as I've heard him favorably mentioned. I read two of his novels this summer, Cat and Mouse and The Big Bad Wolf, and was disappointed in both, probably because they were too graphic and too far-fetched. I was pleasantly surprised by a compendium of mystery stories written by Dorothy Sayers. Of course, I skated through the last Harry Potter book, but am trudging through The Art of the Commonplace: The Agrarian Essays of Wendell Berry. I agree with a lot and I disagree with a lot of what Berry has to say, but these essays make me think and I like his writing style. These are the books that were recently recommended to me. If you have read them, would you recommend them? Blue Virgin by Tracy Chevalier - My friend Mary recommended this book and she rarely steers me wrong. Here's the Amazon description which calls it "clunky," but I enjoyed Chevalier's Girl with a Pearl Earring. One Thousand White Women: The Journals of May Dodd: A Novel by Jim Fergus - Another friend that has given me great book tips (Peace Like a River, Girl Meets God) recommends this story. Would this be called alternate-history since a Cheyenne chief really did propose to trade 1000 horse for 1000 white women? Gilead: A Novel by Marilynne Robinson - I understand that this is an excellent book, especially about fathers and sons, although the premise wouldn't indicate it. The Color of Water: A Black Man's Tribute to His White Mother by James McBride - I don't know the person who recommended this book (it was through my husband's work at the writing center), so if you have read it, let me know what you think. As we head into the fall and winter months (prime reading seasons just like spring and summer), do you have any book recommendations for me? I've had blog posts rolling around my head for several days now, but just haven't had the time to write. Here's an edit I made to a newsletter job recently. Submitted copy: ...a quick and easy way to impact your cost mitigation agenda. Revised copy: ...a quick and easy way to reduce costs. So, as you can imagine, this project is taking longer than anticipated. School started yesterday. My sophomore sons came home brimming with good cheer, burbling about the classes, the teachers, their friends. I am so blessed not to have sullen teenagers, although they have their moments. Date Update: The girl never returned Ron's call, despite his follow-up calls. She always had to go somewhere or do something and would call him back. So he has not yet had a first date. Instead he and his brother went to an early movie and then shopping at the mall to spend their birthday money. We are a little relieved because we now think 16 is still too young to date, but I wish the girl would have had the courtesy to tell him yes or no. I guess she still needs to learn how to decline a date graciously. Garden is looking fine for late August except for the damage done by the dastardly grasshoppers. We are having a plague! I clicked on a link to an article about hope and severe back pain because my sister has been suffering from back pain for some months. I wasn't prepared for the insight, wisdom, personal applicability of the article. Go read about Cheap Hope written by Dr. Stuntz, a professor at Harvard Law School. The twins turn 16 tomorrow. Every year is the "last" year for a party. So we are having a few guys over for swimming, movies, pizza, and games. Even though they are spending the night, it is no longer called a sleepover 'cause that is for kids. "No dating until you are 16" has been our long-standing rule. Since they will have male guests when they turn 16, Ron asked a girl to a movie and dinner the next night. He didn't waste any time and all his father and I can do is look at each other in confusion. Of course, Mom has to drive and the girl hasn't accepted yet. He's trying to determine where to take her for dinner. "It has to be a nice place but not too nice." He decided against Burger King and is leaning toward a Chinese restaurant. Oh, and he asked for money for his birthday to finance this date. He'll soon discover that dating can be expensive in several ways. To balance the last snarky post, let me describe the two bouquets I picked today. On my table is a delightful bouquet in shades of lavender and purple in a little antique jar Hubby bought me years ago. Cosmos. Phlox. Butterfly Bush. On my pantry is a bouquet of pink and yellow glads in a tall green art vase that was a gift from my staff one boss' day. It is amazing how these spots of beauty can charm and soothe me. I like to shop online but I ALWAYS have trouble with PayPal. It has something to do with using Firefox, my cookies settings (but that should be resolved) and perhaps my firewall. Well, someone just lost an online sale! As I wrote previously (which I now cannot easily find), I do not agree with the conventional wisdom for linking blogs to generate traffic as it assumes the goal of my blogging is to get more readers. I link to those sites I find interesting because those who read my blog may also find the sites interesting. Many of the measures of a site's traffic rely on counting links, so the more people who link to your site, the higher you are ranked. This is an excellent post about linking, the bias in current metrics and the forces behind links. The core issue, as I see it, is that the blogosphere is not homogeneous, just like the print media is not. It would be like comparing such diverse print media as the NY Times, The American Poetry Journal, Garden Design, JAMA, the monograph Game Theory, Optimal Stopping, Probability and Statistics, Farmers Almanac, and the local shoppers newsletter. Well, you get my point and I'm having too much fun finding print media to illustrate a point that was already made by Zephoria. "You sure are a good cook, Mrs. Earth Girl"
...so said one of my son's friends to me. I thanked him with a spontaneous smile and a welling pride. Yes, I am a good cook. I learned from the best - my mother - and then honed my skills through Joy of Cooking, experimentation, observation and experience. Some of the dishes I prepared last week were pasta with pesto, chicken, and red peppers; spinach and ham quiche; apple coleslaw; polenta with portabello mushrooms; orange chicken salad. None qualify as gourmet, I suppose, but all were healthy and delicious and appreciated by my family. I enjoy getting an idea for a dish, reading several recipes and then creating my own version. I remember getting upset with my mother when I was first married because she couldn't give me her soup recipe. She made the best soups ever but each time it was different based on ingredients on hand and whatever captured her fancy. I understand now and employ some of her basic soup-making techniques (homemade stock, fresh ingredients, and seasonings other than just salt and pepper). So I was pleased that this teenager noticed my cooking. But pride goeth before a fall. He then added, "You make the best macaroni and cheese." That dish, dear reader(s), was not my recipe using bechamel sauce and several types of cheese, but it was prepared by my son using the Kraft Macaroni and Cheese box. It is amazing how tranquil the home feels when it is organized. The boys' computer room also serves as the exercise room. The newly painted room is furnished with the computer desk and two chairs, exercise bike and mats, and three bookshelves. The very old and battered metal closet doors are discarded for an open storage area for their "stuff." Adding the rug, window treatment and some pictures completes the room for now, although I would like to change the window treatment at some point. The brass bed is in the larger bedroom with dresser, nightstand, bookshelf and desk. Today I purchased a new comforter and decorative pillow to complement the curtains. The pictures and accessories were hand selected by son, who has faithfully made his bed and picked up his laundry for about a week now. This is a small miracle. To complete the room all we need to do is hang the mirror. The other son has the twin bed and antique dresser. The room also includes a small desk and bookshelf. The closet is organized with 15 pairs of jeans and I didn't bother to count the shorts! His brother had a growth spurt first so he has all of his clothes plus his twin's hand-me-downs. Pictures are hung and the windows are finished. I still have a project to create a cosmic headboard for which I have all the material. Perhaps I shouldn't be thinking about when we have an empty nest, but my plan is for one guest bedroom, a sewing/craft room for me and a room for hubby for exercise or whatever he wishes. After buying the bed and dresser, we have four days to get the boys' rooms ready, two bedrooms and a computer room to de-junk. The plan is the normal pitch, donate or organize routine. Also Rick's bedroom is in great need of painting. We start with Rick's room. Do you know how much stuff can be stuffed under a bed, stacked on the unused upper bunk and hidden in a closet? I commandeered the dining room table for sorting and stacking and the sitting room for holding what would be returned to the rooms. His empty laundry basket is soon brimming with "found" clothes. 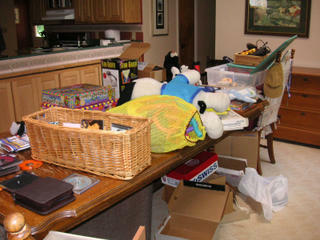 We carry bag after bag out to the garbage can and we start filling up boxes for the church's rummage sale. Hubby commences with leading the boys in painting, beginning with patching a few mysterious holes in the wall. As we paint, Ricky decides that he wants the computer room for his bedroom, so that is the next room to de-junk. The garbage can is overflowing, the boxes for the rummage sale stack up and we add more "treasures" to the dining room table to organize. Finally we tackle the last bedroom, resulting in the use of two back-up garbage cans. If you think I'm exaggerating about the chaos, here is the proof. I almost didn't post these pictures because it was so bad. I couldn't bear to take pictures of the donations and the trash cans! It began so innocently. An elderly widowed neighbor sold her house and was having a sale. So I woke early one Friday and walked down to see what she had. Regardless of my efforts to simplify my possessions, who knows what treasures I would find? The first quick perusal yielded nothing of interest. Then the daughter mentioned that they would be cleaning the attic that night and more stuff would be out...including an antique brass bed. I expressed interest as the twins needed new beds. They had outgrown their beds and I wanted something that could be used for a guest bedroom once they flew the coop. So she took me upstairs. The bed was beautiful, though tarnished. It was dated 1913 and was her grandfather's bed. It is very masculine with massive brass columns. I bought it immediately before we even came downstairs. At the bottom of the stairs an antique dealer was waiting like a vulture ready to swoop in on his prey. He said he wanted to see the bed but it was already sold! This never happens to me. I went home pleased after arranging to pick it up the following Wednesday. The next day I walked down again to see what the attic yielded. I missed a beautiful 100 year old dresser because it had been refinished in an ugly stain with ugly pulls. I decided to talk to Steve first who said "One twin can have the bed and the other twin the dresser." I returned immediately to announce I wanted to buy the dresser. The daughter acted a bit flustered as she was in final negotiations with another woman. I moaned and told them the two sons, two pieces of furniture story. The woman who was buying the dresser told me I could have it! She was buying it as an impulse for her entryway and I had a much better use for it. How sweet. Now I had a "new" piece of furniture for each bedroom. And that was how my nightmare began. 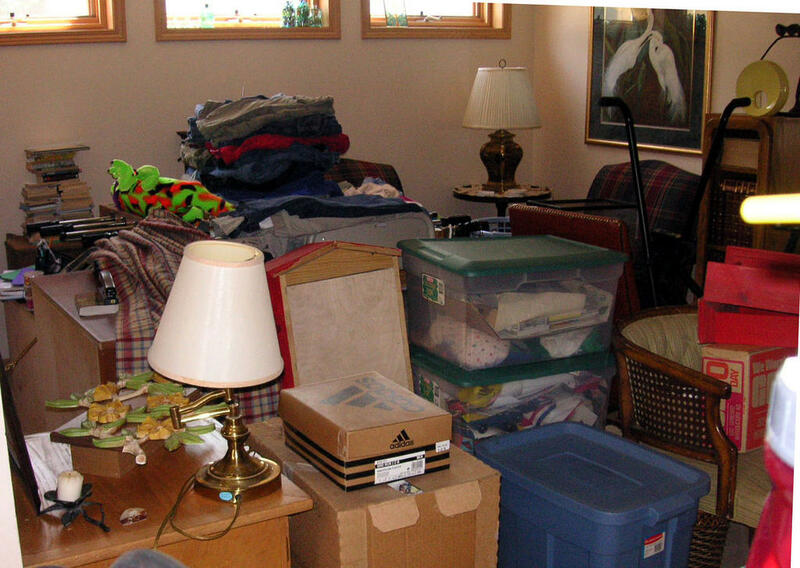 To foreshadow the Chaotic Middle, just imagine what two teenagers can cram into three bedrooms. I'm going to stick with this template for a while...until I have time to invest in the design I want. It is similar to this one, but it does not seem to work with Blogger. Of course, with freelance projects, school starting, my fall volunteer schedule, it may be a while before you see any changes. Update: You may have to refresh the screen to have it display properly.